I had been wanting to make a non-baked dessert for a while, I decided on Tiramisu while watching repeats of ‘Nigellas Kitchen’. When looking for recipes I was split between ‘quick’/’cheats’ Tiramisu; which didn’t use any eggs or ‘real’/’authentic’ which did. Cream or no cream. Only Egg yolk or egg yolks and egg whites. A few months later, when I was completely caked out (October tends to do that to me, my next few posts will explain why, religious celebrations/lots of birthdays) but still craving sweets, I decided to revisit Tiramisu. I decided on Anna Olsens recipe as I had seen that episode and remember dribbling over it, and to help me with quantities one from Bakers Royale(which is a great blog I recently discovered). I prepared a mug of strong instant coffee and left that aside to cool, I didn’t add sugar as I don’t like sweet coffee and felt bitter coffee would be a nice contrast to the sweet mascarpone cream (I needed an extra half mug). In a separate bowl (unfortunately the second bowl can’t be avoided) whisk the eggs whites till they are at stiff peaks. Put one – two spoons of the egg whites into the mascarpone/yolk mix and fold in, then spoon the rest in carefully fold in. I used Savoiardi biscuits (Italian lady’s fingers), one pack would have been enough if I didn’t eat a load of them (quality control *ahem*). Dip the biscuit in the coffee, once soaked (which is pretty much immediately) quickly place in your serving dish. Once the dish is lined cover with half of the mascarpone cream. 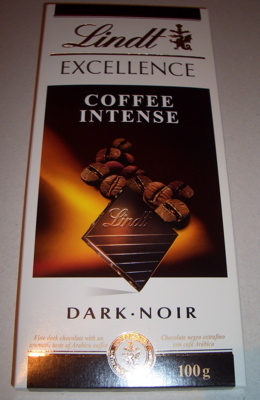 I then added my own twist, and sprinkled grated Lindt Coffee Intense over the mascarpone cream. This gave the Tiramisu a great texture, especially with the coffee bean granules in the chocolate. Place another layer of sponge fingers topped with the rest of the mascarpone cream and sprinkled with more grated chocolate. 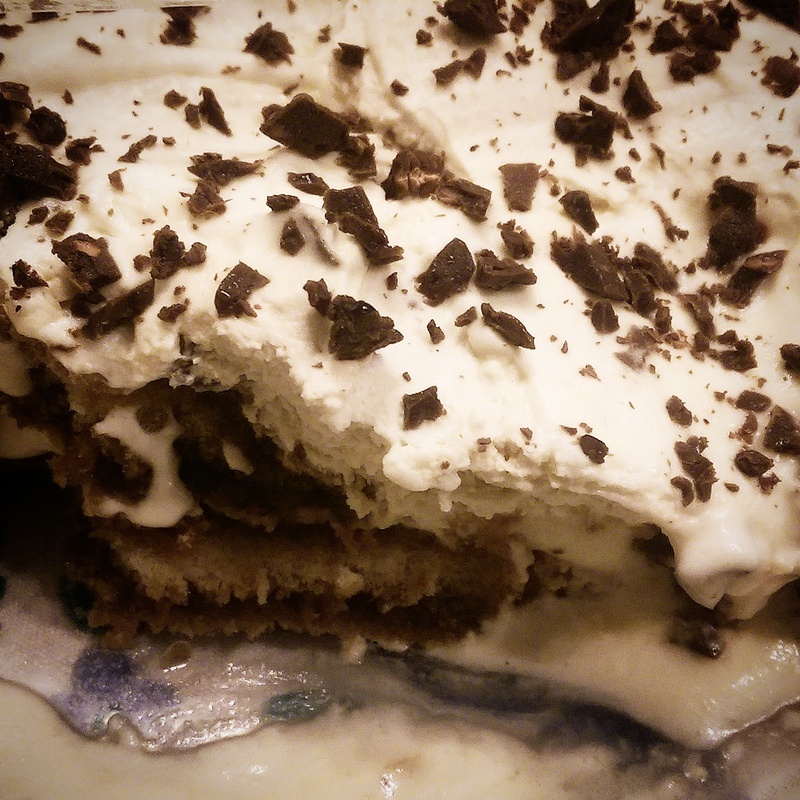 To finish the dessert I topped it with a layer of double cream. I whisked a tub (250ml) of double cream till it was at soft peaks, I then sifted two tablespoons of icing sugar and a few teaspoons of coffee (to taste) and whisked til slightly thicker and then spread over the top. The cream probably would have looked prettier if I had piped it. Or I could have used a stencil and dusted cocoa over it. As this was made when I was in a greedybutlazy mood, I just grated the rest of the chocolate on top. This was chilled and eaten about three hours later (like I said, greedy mood), and was very good, however, when I ate some leftovers (I know, shocking!) the next day it tasted even better. I would definitely recommend patience and chilling it over night. This entry was posted in dessert, no bake and tagged dessert, homemade, nobake, nonalcoholic, tiramisu on October 19, 2014 by maryambakes.